Audi A3 S Line Manual 6 speed gear knob & gaiter 2016 Audi A3 S line 8V 6 speed gear knob & gaiter as shown in good used condition. 2016 Audi A3 S line 8V 6 speed gear knob & gaiter as shown in good uséd condition. Audi A1 A3 gearknob with leather gaiter. All prices quoted are for mainland uk only. Any item sent out by us incorrectly will be resolved within 24 hrs. Part Number: 8K2713041AD. Model: A4 B8 / A5 8T. Make: Audi. Here we have is a 1996 Audi A4 1.8 2.0 tdi gear gaiter knob in fair condition for age. was removed from a 1999 A4. also will fit other models as well. Donor Car: 2006 Audi S6 C6 Avant 5200cc Quattro Sport. The New and Used Audi Parts Specialist for all Audi models worldwide. Audi Part Number: 4F2 713 139 L. It may fit others. Part number: 8K2713041AF. A complete and genuine 2010 Audi RS5 4.2 CFSA petrol automatic gear selector as pictured. Engine : 4.2 CFSA. This item has been removed from a: 2010 AUDI RS5 COUPE. Model: RS5. 8P0 864 261 D. Audi A3 8P Manual 6 Speed Gearstick/Gear Knob With Gaiter. (SECOND HAND). UP FOR SALE . - AB36-38, AB55-56, FK17-21, IV1-39, IV52-54, IV63, KW1-14, PA21-40, PH19-26, PH30-41, PH49-50. (SECOND HAND). Scottish Highlands. - HS1-9, IV40-51, IV55-56, KA27-28, KW15-17, PA20, PA41-49, PA60-78, PH42-44, ZE1-3. 4F2 713 139 T. Audi A4 A6 C6 Gear Knob Gaitor Automatic. (SECOND HAND). There May Be Scratches. - AB36-38, AB55-56, FK17-21, IV1-39, IV52-54, IV63, KW1-14, PA21-40, PH19-26, PH30-41, PH49-50. Scottish Highlands. 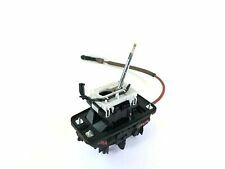 AUDI A1 Hatch 2011 Headlight Switch Part Code: 8p0919094 Shelf No: D183. Sat 8.30am - 3.30pm. Donor Car: 2002 Audi TT Coupe 1800cc Quattro. The New and Used Audi Parts Specialist for all Audi models worldwide. Audi Part Number: Unknown. It may fit others. Manufacture Part Number 8L0863278BG6BN. Note a3 2001-2003. Item Specifics:2000-2004 - 1.9 DIESEL - 5 SPEED MANUAL - GEARBOX LINES / LINKAGE - WITH GEAR STICK - PART NO 8E0711025. Part:Gearbox Lines. This Gearbox Lines was removed from a2002 car and has been fully inspected. Audi TT TTS TTRS 8S Models. 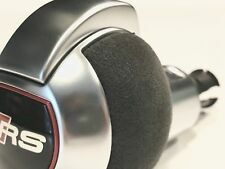 This newly designed RS Sport gear stick has a top quality suede finish which gives it a modern unique look. Genuine OEM Audi Part! THIS IS FOR THE AUTOMATIC GEAR SELECTOR. 56 PLATE 2L PETROL AUTO. COLOUR PHANTOM BLACK LZ9Y. WE CAN ALSO FIT THE PARTS YOU BUY FOR A FEE. WE DO OUR BEST TO SHOW ALL MARKS/ SCRATCHES/ RUST ETC ALONG WITH PART NUMBERS THAT ARE AVAILABLE. AUDI Q7 2006-2015 AUTOMATIC GEAR KNOB GAITER. (SECOND HAND). - AB36-38, AB55-56, FK17-21, IV1-39, IV52-54, IV63, KW1-14, PA21-40, PH19-26, PH30-41, PH49-50. Scottish Highlands. - HS1-9, IV40-51, IV55-56, KA27-28, KW15-17, PA20, PA41-49, PA60-78, PH42-44, ZE1-3. Audi TT Mk2 Auto Gear Shifer And Gator. Condition is Used. Has a small crack on the button but it does not affect the usage. Donor Car: 2005 AUDI A4 B6 Cab 2500cc. The New and Used Audi Parts Specialist for all Audi models worldwide. It may fit others. Audi Part Number: 8E2 713 041 AD. Manufacture Part Number 8S08632781KT. Note Audi TT / TTS 8S 2014-. Type Gearsticks & Gear Knobs. Genuine Audi A3 8V 2013-2016. Dashboard Switch Panel Start Stop DS. Second Hand Item Previously Fitted. (SECOND HAND). - HS1-9, IV40-51, IV55-56, KA27-28, KW15-17, PA20, PA41-49, PA60-78, PH42-44, ZE1-3. VW,SKODA,SEAT,AUDI 1.6 TDI OIL FILTER HOUSING & COOLER. THE KEY BROKEN BUT WORK PROPERLY. GENUINE PART.